How to build muscle and burn fat …without morphing into a big, bulky bodybuilder. Have you failed to get in great shape after weeks and months of going to the gym? Do you lack confidence in the gym, feel too weak, or feel self-conscious about your current bodyshape? Are you put off lifting weights because you don’t want to end up with the bulky, overgrown bodybuilder look? No need to worry. This new book is all about strength training NOT bodybuilding – and yes there is a difference. It doesn’t matter if you’re just starting strength training, or have been hitting the gym for a while and are frustrated at not seeing any results. This is the essential guide on how to build muscle burn fat, and develop a lean, athletic, awesome body…instead of becoming a super-inflated bodybuilder. Strength Training NOT Bodybuilding is written by Marc McLean, an online personal trainer who has two decades worth of experience in weight training. It’s already racking up rave reviews on Amazon from men and women. Marc's mission is to help people like you become leaner, stronger, more confident versions of themselves. It all begins with lifting weights, pushing yourself hard, and developing a rock solid body and mind. Strength Training NOT Bodybuilding is like no other fitness book because it focuses on strengthening the mind and creating a new self-image…both of which are HUGE factors in achieving your goals in and out of the gym. This book includes the strategies that Marc has used to help transform numerous men and women from being self-conscious, unfit, self-critical, unhealthy and weak…to strong, lean, confident, and achieving their goals in and out of the gym. "I have read my share of health and fitness books, and this one is great. 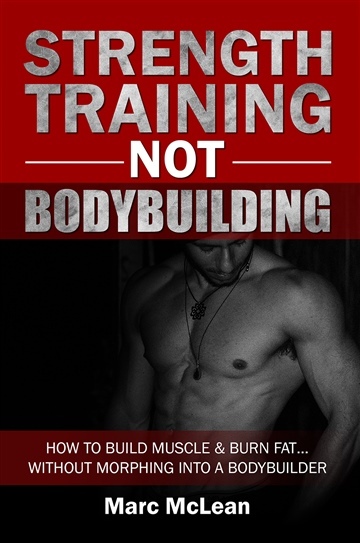 If you are like me and desire a fit, strong body...without the massive bulk....READ THIS BOOK. It is practical and clear." - Marcus Butler. "This book spoke to me personally on the self image section. In high school, I really struggled with body image from getting picked on, and setting too high of expectations for myself. But, Marc’s book clearly states that the BEST transformation is your own. Wanna know why? Because no one else can mimic your transformation. We are all unique in our own way, but we can ALL get into strength training!" - Alec Westerbur. "Another brilliant read from Marc! This book is packed with useful information for strength training. I have read so many books in the past that have just scared or confused me with language and information I haven't understood. Marc explains strength training and all the exercises so clearly. I have read a few of Marc's books and totally recommend them to anyone, man or woman! So well written and easy to follow and understand. This is a must for anyone starting strength training." - Karen Wildridge.